Redskins fans.... It's time to get mad. Real mad. And after you're good and mad, it's time to do something about this issue I shall tell you about right now. 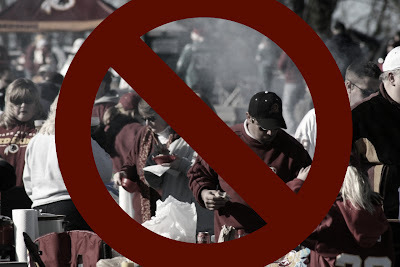 Dan Snyder is trying to take away Redskins Park tailgating. And no, I'm not lying. Say WHAT?!?! So if you want to tailgate you'd have to get there hella early so that you could get one of the special spots, that are really not so great. Awesome.... Not. They're also saying that these rules could only be in place for a year, so that Snyder could "compromise" with everyone and say "you can tailgate, if you pay a fee." Look... I think Redskins fans are pretty ride or die. HOWEVER... No tailgating at a football game is almost like no cheerleaders. Maybe even worse. People can be fans from home, which would lose the "12th Player" effect. I hate that Dan Snyder is so much more about money than this stupid team. With as much love as the fans have, you'd think he'd at least have a little bit to give. I still plan on assassinating him some day. Who's with me? Mom told me it was fine as long as I didn't lose my internships, but those were last summer, so I think I'm allowed!!! You lost the 12th man effect when the Steelers came to town last year for Monday Night and it was so loud that JC had to resort to a silent count on offense.